Only four men commanded Nazi extermination (as opposed to concentration) camps. Franz Stangl was one of the. 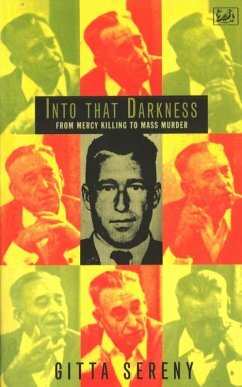 Gitta Sereny's investigation of this man's mind, and of the influences which shaped him, has become a classic. Stangl commanded Treblinka and was found guilty of co-responsibility for the slaughter there of at least 900, 000 people. Sereny, after weeks of talk with him and months of further research, shows us this man as he saw himself, and 'as he was seen by many others, including his wife. To horrify is not Sereny's aim, though horror is inevitable. She is seeking an answer to the question which beggars reason: How were human beings turned into instruments of such overwhelming evil? Gitta Sereny is of Hungarian-Austrian extraction and is trilingual in English, French and German. During the Second World War she became a social worker, caring for war-damaged children in France. She gave hundreds of lectures in schools and colleges in America and, when the war ended, she worked as a Child Welfare Officer in UNRRA displaced persons' camps in Germany. In 1949 she married the American Vogue photographer Don Honeyman and settled in London, where they brought up a son and a daughter and where she began her career as a journalist. Her journalistic work was of great variety but focussed particularly on the Third Reich and troubled children. She wrote mainly for the Daily Telegraph Magazine, the Sunday Times, The Times, the Independent and the Independent on Sunday Review. She also contributed to numerous newspapers and magazines around the world. Gitta Sereny is of Hungarian-Austrian extraction and is trilingual in English, French and German. During the Second World War she became a social worker, caring for war-damaged children in France. She gave hundreds of lectures in schools and colleges in America and, when the war ended, she worked as a Child Welfare Officer in UNRRA displaced persons' camps in Germany. In 1949 she married the American Vogue photographer Don Honeyman and settled in London, where they brought up a son and a daughter and where she began her career as a journalist. Her journalistic work was of great variety but focussed particularly on the Third Reich and troubled children. She wrote mainly for the Daily Telegraph Magazine, the Sunday Times, The Times, the Independent and the Independent on Sunday Review. She also contributed to numerous newspapers and magazines around the world. Her books include: The Medallion, a novel; The Invisible Children, on child prostitution; Into That Darkness; and a biographical examination of Albert Speer. Gitta Sereny died in June 2012. "She takes us sharply and deeply into the hierarchy of the death camps; the methods used; the experiences of the very few survivors, both inmates and guards"